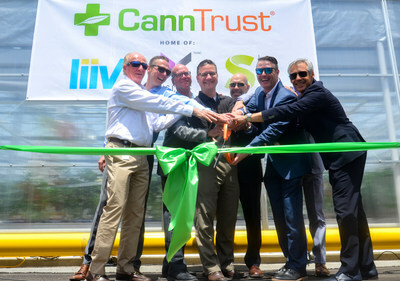 VAUGHAN, ON, June 26, 2018 /CNW/ – CannTrust Holdings Inc. (“CannTrust” or the “Company”) (TSX: TRST), one of Canada’s leading licensed producers of cannabis, today held the official Grand Opening of its Niagara Perpetual Harvest Facility (the “Facility”), the first such facility in Canada. The 450,000 sq. ft. hydroponic facility sets new standards for the industry. The current annual output from the Facility is estimated at 50,000 kilograms. In addition, the Company has begun construction of an additional fully funded 600,000 sq. ft. expansion, that when completed, will double CannTrust’s annual capacity to in excess of 100,000 kilograms. In order to position itself as a major participant in the expanding worldwide cannabis market estimated at $180 billion annually, CannTrust has to-date invested close to $40 million at the Facility. The Facility will position CannTrust as one of the lowest cost producers of high quality cannabis flower and dramatically increases CannTrust’s cost-efficiency of taking cannabis from seed to sale through a unique combination of technology, science and expertise. CannTrust’s perpetual harvest facility, while maintaining and in most cases exceeding indoor product quality, is projected to produce at a cost per gram that is significantly below traditional indoor production facilities. Future on-site innovations at the Facility indicate that the production cost per gram will drop even further. Precise control of every aspect of the facility’s environment, from light and irrigation to temperature and air movement, to ensure optimum growing conditions. The Facility will ultimately employ around 250 people, most from within the local Niagara region. CannTrust is proud to be a valued member of the Niagara Community and has joined with Niagara College to help develop its Commercial Cannabis Production (CCP) Graduate Certificate Program. CannTrust will participate in practicals and teaching sessions at the College and will hire College interns and summer students to work at the Facility. The graduates from this program will help address CannTrust’s growing need for knowledgeable employees in this specialized field. “It truly is a win-win for all involved,” said Michael Camplin, General Manager of the Facility and a member of the local Niagara community. “The size and scope of this facility is a testament to CannTrust’s industry leading achievements and is setting new industry benchmarks for high-quality yields and reduced costs. Operating a facility of this scale, CannTrust is well-positioned to meet the increased Canadian and global demand for cannabis. With the legislation legalizing cannabis for adult consumer use having now passed its final official step and retail sales due to commence on October 17, 2018, our perpetual harvest facility offers CannTrust even more opportunities to lead the industry with its disciplined, scientific approach. It is a very exciting time for the industry and CannTrust is poised to be at the forefront of this evolving landscape,” says Brad Rogers, President, CannTrust. Since its inception in 2014, CannTrust has led the Canadian market in producing standardized product. As a federally regulated licensed producer, CannTrust brings more than 40 years of pharmacy and healthcare experience to the medical cannabis industry. CannTrust currently operates a 60,000 sq. ft. state-of-the-art hydroponic facility in Vaughan, Ontario, as well as the recently completed 250,000 sq. ft. Phase One redevelopment of its 450,000 sq. ft. Niagara Perpetual Harvest Facility. The Phase Two expansion is underway and is anticipated to be completed and in cultivation by fall 2018. Phase Three construction, with an additional projected 600,000 sq. ft., is fully funded and has begun.